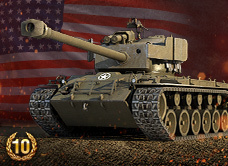 As we celebrate Independence Day in the USA and you fire up your tanks and barbecues, we've got all the discounts and missions a Yankee Doodle Dandy could need! Starting with a x5 first win bonus, pick up cola and boosts to crank up your Credit and XP earnings all weekend long! Experience on First Victory of the Day! Earn the Defender Achievement in a single battle. Destroy 10 enemy vehicles over any number of battles. Complete Fireworks Display mission a total of two (2) times. Complete Fireworks Display mission a total of three (3) times. Play in three (3) unranked Team Battles. Play in three (3) ranked Team Battles. Boosters of the same type do not stack, and will last until September 1. Earn 3,750 XP in any number of battles. Complete Freedom to Play: Quad a total of four (4) times. 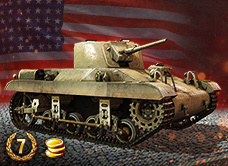 *Earning 45 FTP Keys unlocks the rental of the FV201 (A45). See the Freedom to Play article for more details.